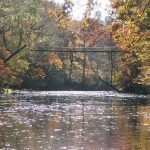 About: Located in the foothills of the Appalachian Mountains, Tishomingo State Park is steeped in history and scenic beauty. Archaeological excavations confirm the presence of Paleo Indians in the area now encompassed by the park as early as 7000 B.C. ; the park takes its name from the leader of the Chickasaw nation, Chief Tishomingo. The famous Natchez Trace Parkway, the premier highway of the early 1800s and a modern scenic parkway, runs directly through the park. Today’s visitors to Tishomingo State Park discover the same timeless natural beauty that enchanted the Indians centuries ago. Tishomingo offers a unique landscape of massive rock formations and fern-filled crevices found nowhere else in Mississippi. Massive boulders blanketed in moss dot the hillsides, and colorful wildflowers border trails once walked by Native Americans. The 62 sites available for RV camping feature picnic tables, grills, and water and electrical hook-ups. Restrooms, showers, and a central sewage dumping station are located in the developed camping area. Each RV pad offers direct access to Haynes Lake. All campsites are available for advance reservations. A large, heavily wooded area overlooking Haynes Lake is available for tent camping. Water, restrooms, and showers are located within walking distance of the primitive camping area. A 13-mile nature trail system traverses the park, winding along rocky ridges with spectacular views, through shallow, fern-filled canyons, and beside the churning waters of Bear Creek. Trail maps are available at the park office. Disc Golf is a sport that can be played year round and is enjoyed by all ages. There is no fee to play. Rental discs can be obtained at the park office. Also, new discs and other accessories are on sale. The park has three courses “Chickasaw Trail”, “Warrior Ridge” and “Tushka Run”. Score cards can be obtained at the Park Office. A 6.25 mile float trip down rocky-bottomed Bear Creek operates daily from mid-April until mid-October, (weather and water level permitting). A fee is charged. Scenic sandstone bluffs, lush greenery, a canopy of mixed hardwoods and pines, shoals and rapids with long pools in between provide an enjoyable and exciting trip. Everything you need is provided by the park: canoes, paddles, lifejackets and transportation. Lifejackets must be worn the duration of the float trip. There is a limit of two persons per canoe. One small, collapsible, lunchbox size cooler per canoe will be permitted on the trip. Tishomingo County is a dry county – No alcoholic beverages will be allowed. Coolers are subject to search. The scheduled departure is 10:00 a.m. Advanced reservations are recommended. All persons wanting to take the float trip must report to the Park Office 30-minutes prior to departure time. Canoeist leave their cars at the park’s Swinging Bridge Area and are transported upstream to begin the float trip. 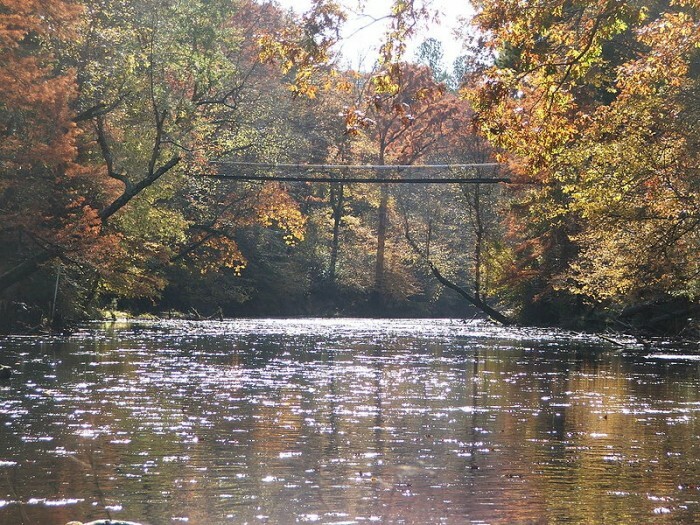 Participants return to the swinging bridge approximately two and a half to three hours later (dependent upon water conditions). At the end of the trip, all canoeist are required to load their canoes on the trailer provided.